There is no average Bitcoiner, but neither is Bitcoin a perfect reflection of wider society. That said, discussion of imbalances within the community should not be overstated, and should account for where the project stems from (finance, technology, politics) and what the project is a reaction to (crisis, uncertainty, alienation, and rapid social change). Furthermore, as blockchain technology matures and diverges, it makes more sense to think in terms of a “cryptocoin ecosystem” than a single, monolithic community. The Bitcoin community has been criticised recently as “a rich white male disaster,” and stats from this website were used as evidence to build this case. This perspective seems to be that of an outsider, and on that basis is important for the Bitcoin community. External appearances matter, especially for a project whose future depends on converting new users. But also important is the more nuanced picture that emerges from inside the community. There are already some very measured pieces out there on the gender question, most notably Brett Scott’s thoughtful analysis of community narratives of negative freedom. As is widely reported, gender imbalance is unfortunately a rather predictable characteristic of a community that sits at the intersection of finance, technology, and politics. If we are to politicise this imbalance, the critique should be aimed at the wider imbalances of which the Bitcoin demographic is a symptom, rather than demonise the men who have joined the community in good faith. Beyond the gender question there are a number of shortcomings in the “rich white men” narrative. The main evidence offered to support the claim that Bitcoiners tend to come from a wealthy background is their libertarian politics, but this is a weak argument. Not all Bitcoiners are libertarian, and not all libertarians are rich. In fact, the libertarian contingent seems to be getting drastically diluted by the arrival of more mainstream community members. The results so far from the 2014 community survey suggest the community is now only about one quarter libertarian, matched by a quarter liberal, and a quarter more left-wing, with a few smaller groups of other political identities. When asked to choose a political label, we get responses from all four quadrants of the political compass. 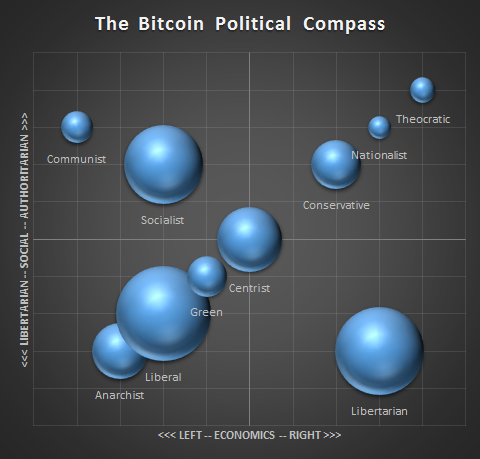 Bitcoin has a diverse range of political identities. Bubble size represents volume, based on first 300 results of the 2014 Bitcoin community survey. Bubble location on the compass is an illustrative approximation. More importantly, a libertarian outlook really is no guarantee of privilege. On the contrary, during my ethnographic research a far more common background story is one of precarious living arrangements, economic uncertainty, and limited opportunities. Bitcoiners rarely talk about how many bitcoins they have, instead focusing on when they first heard about it, when they first got involved, and how they feel about the project. They do not talk about their stash as an asset, but rather as a shared interest. When the cruder financial implications are discussed, they are usually framed in terms of empowerment and escape, the plans for buying a house, raising a family, or gaining the economic freedom to focus on some other project. To understand the sometimes slippery ethics of Bitcoin, we have to account for its roots in rapid social change, crisis, uncertainty, and alienation. We have to account for its perceived dialectical opponent, an entrenched and indifferent economic elite. And finally, we have to give credit to the prosocial and utopian aspects of Bitcoin, a transnational community with no intentional barriers to entry, built on collaboration, relative transparency, and a surprisingly resilient idealism. Even if this quote was intended only to be a timestamp, it gives a sense of the kind of public conversation happening in the background as Bitcoin was developed and released. Yesterday it emerged that Dorian S Nakamoto, a quiet Japanese-American man living in California, may be Satoshi Nakamoto, the inventor of Bitcoin who chose the above phrase for the genesis block. The story is hotly disputed, but if Dorian is Satoshi one of the most interesting implications is that his life has not been one of drug dealing and money laundering, but a far more human story of unemployment and debt, at one point losing his home to foreclosure. Anthropologists sometimes critique the manner in which globalisation leads to the destabilisation of local truths, as old understandings are submerged by new realities. But the financial crisis and its aftermath led to a destabilisation of global truths. Our political and economic orthodoxies collapsed as financiers admitted their ignorance, governments admitted their negligence, and major systemic reform was devised over manic late night phone calls, as the British would say: scribbled on the back of a fag packet. Political hierarchies were nakedly revealed as the money which had been unavailable for tackling climate change or global poverty was magicked into existence to save the banking sector, an industry that had profoundly failed us all, and was rescued for the privilege. So of course we get Bitcoin, which on one level is a philosophical interrogation of the financial status quo. After the financial crisis people no longer just asked how they are supposed to make money, they started questioning the very essence of money itself. Literally. Google search queries for the phrase “what is money” are now over twice pre-crisis levels globally, even after overall Google growth is accounted for. In contrast, the global trend for the query “money” has remained steady. Those who see history and development in linear terms might argue that a blockchain-like protocol was always going to emerge, and its arrival at the height of the financial crisis was little more than a poetic coincidence. But blockchain technology can decentralise any evolving repository of information. As financial thinker Dave Birch put it, the fact that the first implementation of a blockchain should have been a currency is “not immediately obvious.” If we look at the uses of some of Bitcoin’s ingredients (HashCash proof-of-work was used to limit spam, BitTorrent was used to subvert restrictions on popular culture) and some of the applications for blockchain technology which followed (Twister is a Twitter clone, Namecoin is an alternative DNS registry), it becomes clear that there are various problems to which the blockchain could have been applied. Bitcoin’s arrival as a promise to redefine money gives us an insight into the social conditions from which it was born. As outlined by journalist Richard Boase, Bitcoiners tend to trace the currency’s heritage to the cypherpunks, a movement which aims to use cryptography to build stateless safeguards for privacy, anonymity, and free speech. Even if we accept this explanation, the fact that Bitcoin is the first cypherpunk project to break into the popular imagination is revealing in itself. The embrace of Bitcoin’s core mechanism, a protocol which cannot be broken without broad community support, hints at discontent with the ever-shifting nature of legal and economic rulebooks, managed by seemingly inconsistent, arbitrary, and fickle decision makers. Bewildered by this accusation they may be, but decision makers should take note: a discontent of this order suggests systemic instability. We are reaching a point where it is unclear what the “Bitcoin community” means anymore. Over 60% of Bitcoiners have a stake in an alternative cryptocoin, or “altcoin”, and many have a stronger emotional attachment to their more novel holding than to fusty old Bitcoin, the secure but rather obvious and unexciting original. 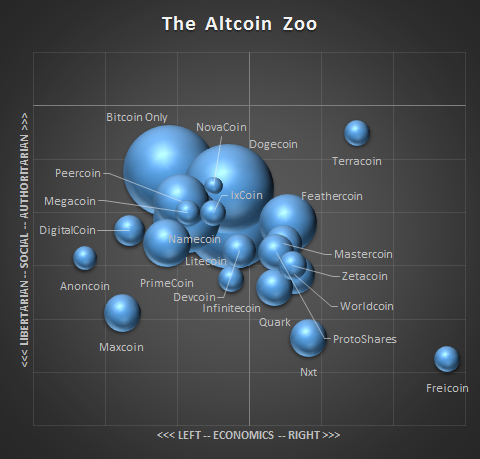 There are over 100 cryptocoins right now, a veritable zoo which defies meaningful taxonomy (though I have tried). Some altcoins have technical tweaks, some have a different political underpinning, some perform a different function, and some are imbued with novelty and personality value. As a very crude exposition of this diversity, we could even plot the average political identity held by altcoin users (note: we have now conclusively left the bounds of ethnographic rigour) on the political compass, again drawing on figures from this year’s community survey. As wooly as the methodology may be, it looks like there is a statistically robust distance between the anons of Anoncoin and the freemen of Freicoin, or between the mainstream memery of Dogecoin and the experimentalists of Nxt. This is not so much a community as an ecosystem. It has become something of an orthodoxy to say that the disruptive force is not Bitcoin but its blockchain, but I still think that one of the defining developments in this story is a new order of self-organising community. Despite being met with mockery, derision, and indifference, a core community of developers and dreamers have built a broad family of novel payment mechanisms. Whether or not they succeed, they have already challenged the role of the state, the hegemony of private capital, and most importantly, our understanding of money itself.